Sarah P’s comments: I received an e-mail from a Research Manager at Wonder asking whether I would be willing to post this opportunity. After some initial research, I can say they are a legitimate company. Here is some more information about working for this company, and also the job description and application link which was shared with me. For the sake of others please share your experience with this company. Join Wonder’s fast-growing network of freelance researchers! Wonder (askwonder.com) is a personal research assistant that saves people time by getting detailed answers and resources delivered to their inboxes by a trusted network of researchers. We’re looking for individuals with exceptional online research skills to join our community of independent paid researchers. Wonder clients post questions about various topics in economics, business, technology, product recommendations and more, and your job is to efficiently track down the highest quality resources across the Web and explain the results in a personable, human way. Wonder allows you to combine your researching skills as a librarian (or library sciences student) with your desire to help provide knowledge to those who seek it, and to get paid in the process. As an independent contractor, you can work whenever you want, as often as you want, and from wherever you want. You also have complete choice over which questions to answer — pick the ones that are interesting to you. Questions get posted to a central dashboard, from which you can choose to claim whichever seem most interesting to you. For each search you claim, you’ll be tasked with finding 5+ links to high-quality sources, and writing a rich summary directly answering the user’s query while adding any insights you gleaned along the way. Sarah P’s comments: Here’s a short-term project from the ever-developing world of virtual opportunities. This company has been around for over 20 years. Here are the Glassdoor reviews. Currently seeking professional catalogers with language expertise in Western European languages for a law cataloging project. The work can be done from home and requires internet access. Knowledge of RDA cataloging rules and experience using OCLC’s Connexion a must. Preference given to those with experience cataloging legal materials. Foreign language ability: We’re particularly interested in Western European languages. High Debt and Falling Demand Traps New Vets – 2013 article which includes information about Ross. Reporting to the Director of Library Services, the Systems Librarian position provides technical expertise, day-to-day administration, and broad support for traditional and emerging library software solutions and standards. The incumbent will use a variety of technologies, along with excellent communication and interpersonal skills, to provide the best possible experience for library patrons and staff as they seek, access, and maintain the information in our library systems. This will include first-line support as well as maintenance and implementation in a broad range of systems with primary, sustained focus on the integrated library system (EOS International). The Systems Librarian will work with the IT department and Instructional Technologists on campus-wide initiatives, and will be responsible for maintaining the library page on the portal. In addition, the Systems Librarian will be the point of contact for vendor technical support to manage other platforms and retrieval system, the Library’s web pages and file servers, staff applications, and selection, installation, and maintenance of hardware and software. Administer, maintain, and support all modules of the Libraries’ Integrated System, EOS International. Serve as the primary liaison to EOS for problem resolution and will be the Library’s representative to the users’ group meetings. Oversee training and instruction of staff on computer services and evaluate performance. Compile and interpret statistics and prepare reports. Maintain documentation and conduct evaluation of policies and procedures for use of computers and computer systems related to the library. Contribute to the library customer service mission by assisting customers and staff as needed. Coordinate library staff and vendors to investigate, troubleshoot and resolve automation system’s hardware and software problems. Work with the cataloging colleagues to develop and maintain database quality and authority control. Collaborate with the IT department and Academic technology team to implement campus-wide information science solutions. Liaise with the Circulation Supervisor to identify and proactively resolve potential systems issues to ensure a seamless user experience. Preferably a Master of Library and Information Degree / MLS from a ALA-accredited school or a Bachelor Degree in Library and Information studies or a related information science field with extensive professional experience. Knowledge of emerging library technologies and awareness of emerging trends in library and information fields. Familiarity with library technology standards and protocols such as Resource Description and Access (RDA). The Archives and Information Management (AIM) Service ensures the accessibility, availability and integrity of all official information produced by and for the North Atlantic Council (NAC) and its Committees within the framework provided by the NATO Information Management (IM) Policy and NATO Security Policy. It provides NATO-wide IM and research support on matters pertaining to the activities of the NAC and its Committees, ensures the preservation of NATO information of historical value on behalf of the NATO Nations, provides training, support and guidance to NATO Nations, partners and entities on the implementation and execution of NATO policies pertaining to information and takes the lead on requirements development for all IM-related technology projects at NATO Headquarters. In addition, AIM is responsible for processing, disseminating, storing, organising and archiving the documentation produced by the NATO Committee structure and by the Departments of the NATO HQ International Staff (IS), taking into account the requirements of NATO Security Policy, NATO IM Policy, and applicable NATO HQ procedures. The IM Clerk is assigned to a Unit of the AIM Services and provides IM support to a designated clientele. As directed, the Clerk will ensure that support is provided in an effective manner – responsive to customer needs and reflecting NATO IM policy and procedures. The Clerk is responsible for the correct and uniform application of relevant working procedures and of information security regulations. possess the following minimum levels of NATO’s official languages (English/French): V (“Advanced”) in one; I (“Beginner”) in the other. professional training or experience in library/information sciences or in international relations. Respond to requests for information; conducting research and submitting results for review. Process documents and correspondence in accordance with applicable procedures and guidance. Apply work procedures and guidelines related to the NATO Information Management Policy (NIMP) and to NATO Security Policy, seeking guidance as necessary. Perform tasks related to the secure handling and processing of electronic files (media control, data extraction, network transfers, etc. ), including the operation of relevant office equipment. Execute other routine or manual tasks, including filing and regular messenger duties. Contribute to the improvement of routine work processes. Work with the other members of the Unit to ensure effective support and quality service to the clientele. Advise customers on practicalities of information support. Under supervision, apply an organisational file plan, maintain files, and prepare files for records disposition. Perform quality checks and contribute to statistics and reports. Participate in cross-functional training assignments within the service and in other professional training as directed. Provide advice on basic IM practices. Perform any other related duty as assigned. The incumbent reports to the Head of a Unit and is responsible to the Head for the performance of all main accountabilities outlined above and such other associated responsibilities as may develop. He/she has frequent contact with Divisional staff to deliver routine information support and to provide advice on related practical and procedural aspects; in this context he/she also works closely with other Archives and Information Management staff to ensure optimal customer support. Definite duration contract of three years’ duration; possibility of an indefinite duration contract thereafter. In accordance with the NATO Civilian Personnel Regulations, the successful candidate will receive a definite duration contract of three years, which may be followed by an indefinite duration contract. Serving staff will be offered a contract in accordance with the NATO Civilian Personnel Regulations. The event description from last year, which may well be reusable this year, said,” For MLS students through seasoned information professionals interested in working internationally, this annual program hosted by IRRT’s International Connections Committee features American librarians discussing their own unique international experiences. Discussions are split between prepared topics and audience Q&A time. These interactive sessions have included such diverse topics as leveraging networks to find work abroad, pre-departure language and etiquette training, adapting to regional librarianship as well as cultural standards, the practicalities of life overseas, and more! This annual program hosted by IRRT’s International Connections Committee features American librarians speaking about their own unique international experiences. Past speakers include: Rebecca L. Miller, Senior Research Officer at Afghanistan Research and Evaluation Unit; Catherine Shreve, Librarian for Public Policy & Political Science, Perkins Library, Duke University; Elly Shodell, Oral Historian Director of Local History Center, Port Washington Public Library, Ray Pun, ALA Emerging Leader 2014, Reference and Research Services Librarian, New York University Shanghai Library, Jim Agee, University Librarian, American University of Phnom Penh in Cambodia. I have been following your blog for a while with an interest in moving in to the international arena. I read above you dislike the term Teacher Librarian which I found surprising. I am a very proud Teacher Librarian. I hold a dual qualification and am required to use both in my role. I teach (in the library) and manage a primary school library. The primary positions I have looked at require both as well. In my opinion a Teacher Librarian and Librarian are two different positions. Would you agree? I am so glad you have written to express your opinion because I believe open dialogue is the key to good solutions and that this discussion points to a large problem for school librarians and libraries. First of all, I agree that having both qualifications and, thus, an educated foot in both worlds is the best. And, just by your writing the question, I suspect that you are already a good teacher and librarian as well. Sadly, however, that is not always the case and thus I do not support the title of ‘teacher librarian’ because I think it adds to the confusion concerning what our role should be within a school. I was raised and educated in the US and began my library work experience there. This meant I was initially working with a population that basically understood the premise of libraries and the concept of information sharing, etc. 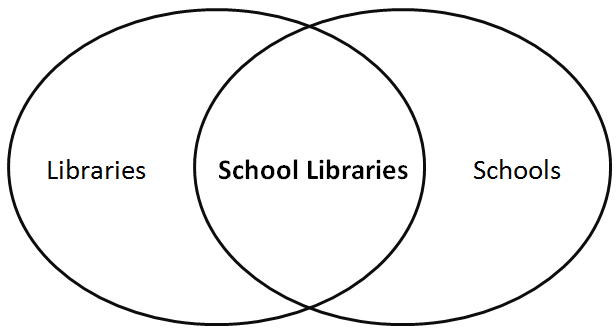 However even in the US, there is great confusion as to what the role of a school librarian should be and the advent of technology has added to this dilemma: hence librarians became school librarians, then media specialists then, in some cases, technology integrationists as well as literacy integrationists. So, there been much confusion as well as conflicting directives about how best to support teachers and students while still operating an open library. This was debated and discussed in my graduate program as well. I then ventured overseas and here is where I really began to question things. I began to work with faculty, staff, and students who had no concept of the ‘western idea’ of librarianship. Almost immediately I revised my library curriculum (this name has also changed over the years, first research skills, then bibliographic instruction, then information literacy – more confusion!) I realized I needed to begin with the basics: what is a library? What is the purpose of a library? How and why are library staff there to help patrons? The real surprise was that I found that, often, international teachers as well as admin had no clue as to what the role of the library was in their school or what it should be. I found myself needing to educate them first in order to gain support for developing an integrated and effective program. Tricky because these folks considered themselves knowledgeable and well-educated. (The better of these educators did admit there was very little time devoted in their training to understanding school libraries.) And, to be fair, librarians themselves as well as ALA are continually out mixed signals about this subject in an attempt to convince everyone how central libraries are. In my career, I was often hired just before an impending accreditation visit and only after the library had been allowed to languish having been being run either by untrained local hires or untrained teachers (meaning not trained in library and information science), who, only seeing the ‘outside’ of the library program, thought they knew what they were doing. This may not be everyone’s experience, it just happened to end up being mine. In one country, I walked into the library and immediately had to duck. From the ceiling hung huge signs declaring all the PYP and MYP concepts. The information literally hit everyone in the face when they came in and obstructed the view and flow of the library. What the heck? I immediately made plans to remove them but my assistants warned me against this as the Elementary Principal thought they were wonderful and necessary. It took some time to unravel the mystery. What had happened was that in a recent IB accreditation visit, the report had noted that the library lacked ‘signage’. Now, of course, any librarian knows that means there aren’t enough navigational aids displayed to allow a user to find what they need in the library, be it space or materials. However, because there was only a local teacher and assistants running the library, there was no one to tactfully inform the principal that his interpretation of ‘lack of signage’ did not mean PYP/MYP criteria! And, as a further complication, neither did the PYP or MYP Coordinators, who also loved this ridiculous as well as hazardous display. I had to say that I had a very good laugh behind closed doors but then I carefully and tactfully approached these well-educated people and negotiated relocating this information to the walls. In another library in another country, I arrived and all looked well. The library needed some re-organizing but it had a reputable database, a good-size collection, and an experienced assistant. For my first 40-minute session with a class of second graders, I planned a 20-minute intro/storytime session and then 20 minutes for book browsing and checkout. Just before my class came in, I shared this plan with my assistant and said I would assist with reader advisory while she checked books out for students. “Um…I don’t think that will leave enough time for book checkout,” she said hesitantly. I assumed, and here made a huge mistake, that she didn’t really know what she was doing and didn’t listen to her. Storytime went as planned and I began the process of getting to know my students by helping them find books. I soon noticed a huge line had formed at the circulation desk. I came over and was absolutely gobsmacked by what I saw. Each student told the assistant their name which she carefully and slowly typed in the computer, often checking spelling as English was not her first language. Then she slowly picked up a hand scanner and held it over the book’s barcode for EIGHT seconds ( I know because I counted!) before the program beeped and checked the book out. I tried to help speed up the process but needless to say, we did not finish checkout on time and I had to apologize to the teacher. Not a great way to begin. I then sat down for an immediate chat with my assistant and this time I LISTENED. The poor woman had no idea why it was happening , had received almost no training from the previous person in-charge who had been…yes, a teacher who had transferred from the classroom to the library. I sighed then dug into the database and soon discovered that the reason why the checkout time was so slow was that the system had never been purged. Every transaction from the six years they had operated the program was still stored and this backlog (supposed to be eliminated at the end of every school year according to the manual) was clogging up the system. So, I immediately created a back-up, then purged the system, contacted tech support and did SIX updates to the outdated program. I set up the hands-free holder for the scanner, printed out a notebook with students’ names, barcode and number and then taught every student their number. I made sure my assistant sat and learned all this and understood what I was doing. Checkout time then whizzed along as it was supposed to and my assistant was far less stressed as well as I.
I would like to say that admin was grateful and impressed both by my knowledge as well as ability to fix the problem but in truth they were rather apathetic. This was due to their being qualified educators but not understanding that a lot of library management is unseen and so to them unimportant. Hence the following scene: they wanted to give me recess duty. This despite my supporting every class in the school as well as sign-up research sessions and being open before school, during lunch, and after school. I carefully explained that I also had to manage a database as well as order and process books and manage the media room. Their reply: they would assign a volunteer to help with cataloguing and database management. I did my best to educate them that this was a very bad idea. But that is how the last librarian did it they said in surprise. I then had to share what a mess the catalog was. The former librarian had imported some records by CD (this was before downloading) but had not checked any of the records and there were many errors. All other material was originally catalogued and she had shunted this job off to untrained volunteers: one had decided to type records in ALL CAPS BECAUSE SHE LIKED THEM, another spelled English as best she could because it was not her first language, another skipped fields she didn’t understand. Lord-of-the-Flies cataloguing! I had a mega-job to try and correct all these errors and no time to do it and they were suggesting more volunteers! I painstakingly explained that handing off the database to inexperienced people was the LAST thing to do because the catalog is the backbone of the program. If it doesn’t function correctly then there is no point having books in the library or teaching students how to use it. And it is a critical skill. As I often share when educating IT staff, the catalog is often a student’s first use of a database. This position was a challenge because the administrators had to be open to admitting they did not really know all this and that they had made a mistake assigning a teacher to the position. Please understand I have great respect for teachers and many of my friends are teachers. But there is a fundamental lack of understanding that a librarian has to have another complete set of skills in addition to a teacher. And we are often working with administrators and teachers who do not understand all that is involved. Therefore, the name of the position is crucial in that it ‘starts as you mean to go on’. If you call yourself a teacher-librarian you are reinforcing the idea you are a teacher and therefore are viewed as a teacher which means you will be reviewed as a teacher and your time assigned as a teacher. I have had many discussions with administrators about ‘student contact time’ and reviews which assessed only my information literacy or storytime sessions. One administrator actually told me I had the easiest job in the school because I had the least scheduled contact time with students. I therefore believe the term ‘teaching librarian’ is far better in inferring the true role. However, the best title overall is ‘librarian’. It is simple, is a name understood in various languages the world over (it’s the second oldest profession! ), and clearly represents what we do. Because aren’t ALL librarians teaching librarians? In every setting and situation we are always helping by informing, teaching and demonstrating. It is an easy and visual way of showing how you have a foot in both camps. I find that once teachers understand this basic concept that we are able to forge better working relationships. If teachers believe you are only a fellow teacher, or worse that you are only there to support them, then mutual respect does not develop. That is not to say that supporting curricula or teachers is not important and much of my time is devoted to that goal as well. If this all sounds not very positive, please know that I have worked with administrators who do understand the library as a separate entity and have worked cooperatively with me to create/upgrade the library. There has also been movement toward a more accurate review process for specialists including librarians. I have lots more stories…but that is why I call myself a librarian and the place I work a library. March 31, 2016 (see below for times). The link to the webinar will be announced at a later date. I will share this when received however click on the link above to mark the page. IFLA Continuing Professional Development and Workplace Learning and the New Professionals SIG have partnered with the American Library Association to present a one-hour webinar about library services to immigrants and refugees including models and best practices from different regions of the world. We believe in libraries serving all the groups in our communities. Therefore, we are glad to collaborate with various library groups to share the most current best practices and models to serve immigrants and refugees. IFLA’s Public Library Section has developed an impressive compilation of services from different regions of the world and a recent campaign about services to refugees. EBLIDA in Europe has developed a strong campaign to promote services to these populations. IFLA’s Library Services to Multicultural Populations Section has produced detailed guidelines and a toolkit about the topic. This is a super team and we are so happy to be able to produce an online resource that will be recorded for colleagues to revisit and listen anywhere at any time. A summary of the online event including links to resources presented during the webinar will be shared later in the Spring. Event moderated by Loida Garcia-Febo, Webinar Series Coordinator, IFLA Governing Board Member, ALA Executive Board Member. Garcia-Febo will share early findings of her research about public libraries serving refugees in the U.S.A.
Link to access the webinar: To be announced at a later time.